The secular media is filled with news speculating that Benedict XVI will soon allow the Tridentine Mass to be said by any priest around the world who would like to say it, unless the Bishop of his area would formally forbid it. The reports present Pope Ratzinger as a clear conservative, or even a traditionalist. Since the theme has become breaking news, it seems to us opportune to bring to the knowledge of our readers what theologian Fr. 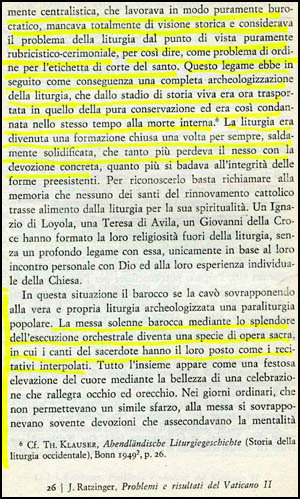 Joseph Ratzinger wrote about the Tridentine Mass in 1966, soon after the closing of Vatican II. It is a quite negative judgment about the Tridentine Mass that makes one wonder about the real reason for the announced restoration, if it indeed takes place. In the text below is an excerpt in which Fr. Joseph Ratzinger analyzes the Tridentine Mass as established by the Council of Trent. 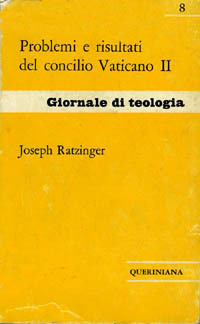 At right, the cover of Problems and Results of Vatican Council II; right below, photocopies from the Italian text; below, our translation of the parts highlighted in yellow. The [liturgical] additions of the late Middle Ages were eliminated, and at the same time severe measures were adopted to prevent a rebirth. .... At that time, the fate of the Western liturgy was linked to a set authority, which worked in a strictly bureaucratic way, lacking any historic vision and considering the problem of the liturgy from the sole viewpoint of rubrics and ceremonies, like a problem of etiquette in a saint's court, so to speak. In this situation, the baroque carved it [the liturgy] superimposing a people's para-liturgy over its true and proper archeologized liturgy. The solemn baroque mass, through the splendor of the orchestra's performance, became a kind of sacred opera, in which the songs of the priest had their role as did the alternating recitals. .... On the ordinary days that did not allow such a performance, devotions that followed the people's mentality were often added to the mass.